It is not a surprise that without waiting for re-inauguration, Armenian president, Serzh Sargsyan will leave for Moscow on March 12 to meet with Russian President Vladimir Putin, MP, political analyst and member of Trend Expert Council Rasim Musabayov said today. "Moscow has always attached foreign policy related legitimacy to the Armenian regime," he told Trend. "After taking office, every Armenian president, prime minister and foreign minister chose Russia as the first country to visit in order to demonstrate their loyalty and reaffirm it amongst their own people that Moscow's patron recognizes and receives them." He added that there is no doubt that Sargsyan will strongly promote the launch of flights to the Khojaly Airport in his coming discussions with Putin. "After all, he publicly promised that after winning the elections, he will personally fly on the first flight," he said. "However, awareness of the seriousness of Baku's warnings that illegal flights over our territory will be prevented which will cause delays and calls for Moscow's support." He said that the Armenian media makes fantastic assumptions about the possible landing of Russian airborne troops in Nagorno Karabakh, which equates to an offer of the dubious honor of "christener" of flights to Khojaly to the Russian military. Obviously, the people making such assumptions are at odds with common sense and international law. Any Russian military involvement in the opening of the Khojaly airport does not only completely negate the version of humanitarian, civil project of opening the airport, but will put Moscow as a sponsor of brute military provocation against Azerbaijan with inevitable negative consequences for the bilateral Russian-Azerbaijani relations and Russia's mediation mission as an OSCE Minsk Group co-chair for the peaceful settlement of the Nagorno-Karabakh conflict, he said. "I am confident that Moscow realizes this and will refrain from supporting Armenia's provocative plans," he said. However, if Moscow acts in an inflammatory manner in regards to the Khojaly airport, it will be difficult for Russia to position itself as an impartial and objective mediator, he said. Regarding the Nagorno-Karabakh conflict settlement process, the adherence to the peaceful settlement of the conflict and support for the efforts of the Minsk Group will be publicly reiterated. 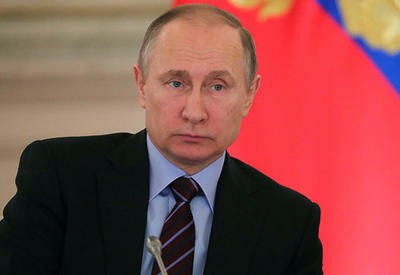 "I do not expect any new initiatives from Moscow in this respect," he said. "One can feel that Vladimir Putin has decided to take a break to show not only the futility of all attempts made by concerned countries and international organizations to make progress in the settlement, but also the inability to make belligerents sit down at the negotiating table." He intends to act only in case of dangerous deterioration of the situation with the risk of sliding into a military confrontation and in response to a direct appeal of not only Baku and Yerevan, but also the international community. One can understand Putin amid ineffective participation of his predecessor Dmitry Medvedev in this matter, who has organized a dozen meetings in the trilateral format with Serzh Sargsyan and Ilham Aliyev, he said. As for the visit to Moscow, then Sargsyan is trying to act wisely, in an Armenian way, this time. Before the inauguration, he decided to go to Moscow to pay the first official visit after re-election to Brussels or at least Paris, he said. Yerevan's media has exaggerating a topic for a long theme that Armenia must focus on Russia in the military-political sphere and develop economic integration with the European Union, he said. Sargsyan does not keep back that he expects Brussels to sign the Association and Free Trade Agreement. He also expects the long-promised donor conference. As a result, 2 billion Euros will be allocated in the form of aid and soft loans. Armenian expectations may not come true regarding the amount, because today, the European Union has enough financial problems and petitioners without Armenians, but they hope to ask for a weighty amount of aid, he said. 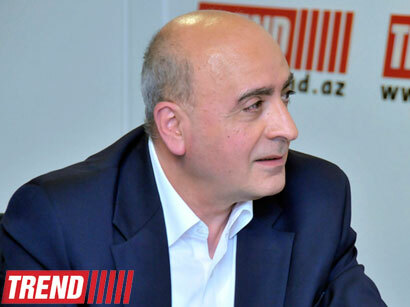 "According to the statements of Armenian analysts and politicians, before joining the Eurasian Union and Customs Union pushed by Moscow, Yerevan first wants to get money from the West," he said. "Serzh Sargsyan wants to obtain additional military and political guarantees from Russia, namely Putin and, if possible, to preserve the preferential prices for gas and nuclear fuel for nuclear power plants at least for the upcoming period." Earlier, Armenian media reported on the intended commissioning of the airport in Khojaly in the near future. The commissioning of the airport is an open violation of the Convention on International Civil Aviation (adopted on December 7, 1944 in Chicago), the Azerbaijani Foreign Ministry reported earlier. Azerbaijan will strengthen the legal use of the application of the Chicago convention. Azerbaijan banned the use of its airspace over Nagorno-Karabakh occupied by Armenia, as no one can guarantee safe flights in the area, the Azerbaijani Civil Aviation Administration said earlier. According to Azerbaijani Civil Aviation Administration, Armenia's steps towards the operation of the airport are attempts to violate international aviation law. This air space belongs to Azerbaijan, so its use by Armenia is illegal. Azerbaijan and Armenia signed a ceasefire agreement in 1994. The co-chairs of the OSCE Minsk Group - Russia, France and the U.S. - are currently holding peace negotiations.